Marianne Snyder discusses the everyday challenges and triumphs raising her autistic son. When my child was diagnosed with autism, he was just one child out of 500 children. 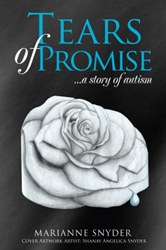 Within the pages of Marianne Snyder’s new book, Tears of Promise: A Story of Autism, ($14.49, paperback, 9781545607046; $6.99, e-book, 9781545607053) readers will find a valuable resource for anyone touched by autism. A source of realistic encouragement and hope, Snyder details how God turned her family’s struggles and heartache into victory and blessings. Marianne Snyder is the author of such books as Revealing the Tapestry, Beauty of the Tapestry and the Warrior King, and With Love from Cocoa. Her love for children with special needs and the Special Needs Community encouraged her to share her family’s compelling story of autism. For numerous years, she was an elementary educator and now enjoys homeschooling her youngest. Marianne was raised in Nebraska but for over thirty years has lived in Phoenix, Arizona where she and her husband have raised their four children. Xulon Press, a division of Salem Media Group, is the world’s largest Christian self-publisher, with more than 12,000 titles published to date. Retailers may order Tears of Promise: A Story of Autism through Ingram Book Company and/or Spring Arbor Book Distributors. The book is available online through xulonpress.com/bookstore, amazon.com, and barnesandnoble.com.